L 12″(31 cm) W 25″(64 cm). Usually silent. Will give high pitched “kik-kik-kik” on breeding grounds. Description: Long, narrow, strongly banded tail. Blue-gray above, black tail bands. Females and immatures are brown above, with buff tail bands. All are buff below with brown streaking. 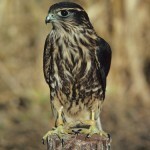 Lack strong facial markings that are typical of other falcons. Food: Diet consists mostly of small birds. 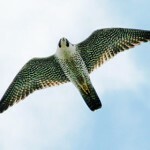 Habitat: Often perches on elevated sites such as telephone poles or tall trees in open country. Nests in trees near grasslands or croplands. Where in Nebraska: Uncommon migrant and winter visitor across the state. 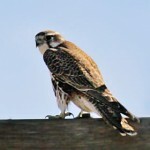 Rare summer resident in Pine Ridge area. Rare nester in western Nebraska. 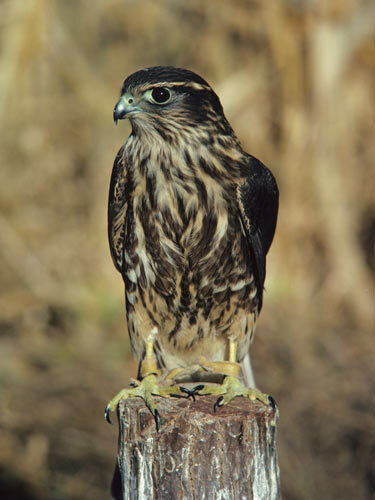 Fun Facts: The Merlin does not build a nest, but instead takes over old nests of other raptors or crows.